I get as nostalgic as the next guy. After all, when it comes to vape products, some things are timeless. 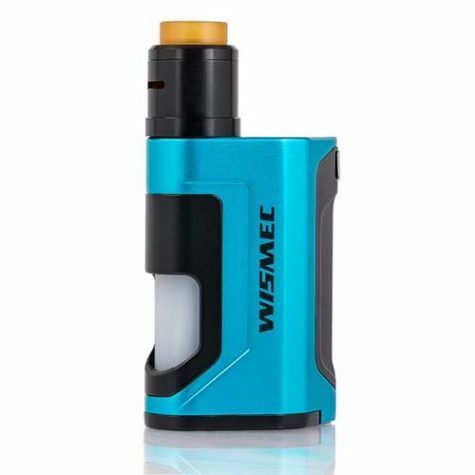 Kinda like Wismec’s classic JayBo-designed looks and proven functionality under the hood. 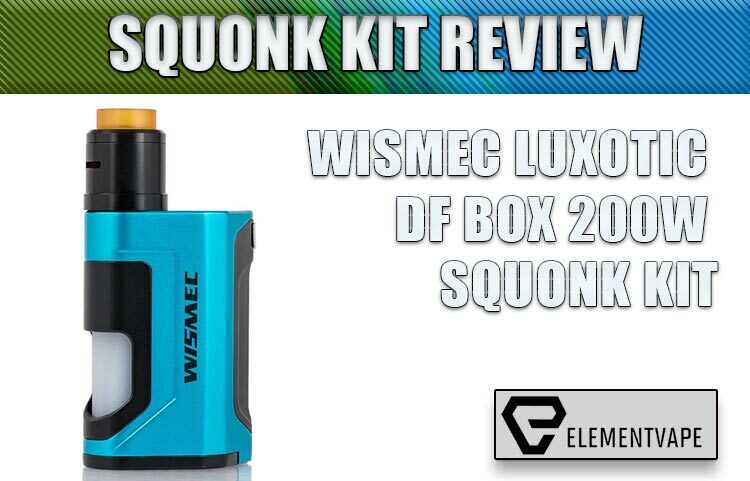 So, why does the Wismec Luxotic DF Squonk Kit – which comes across like a blend of some well-loved design concepts — seem so half-baked? I think the answer lies in the calendar. Because it’s 2019. And most of these design choices weren’t groundbreaking three years ago. 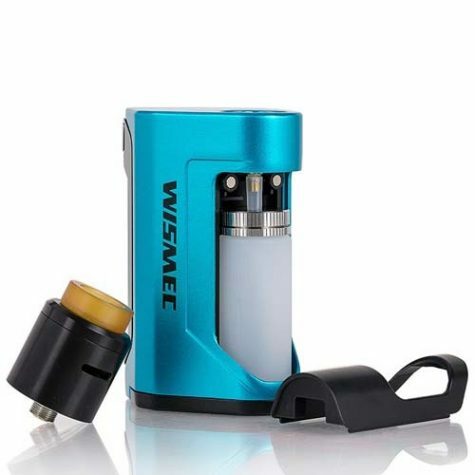 The look is just like the Wismec RX Gen 3, save for the standard squonk bottle cutaway. The display was one we loved in early 2017 but can take or leave today. And the overall package seems slapped together, rather than thoughtfully mapped out. But we don’t vape looks, so let’s take a closer look to see if there’s some beauty to be found deeper than skin level. We should probably back things up a bit and acknowledge that we were pretty excited to get the Luxotic DF in our hands. 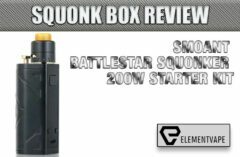 After all, a dual 18650, 200-watt squonk mod is something Wismec probably should have tackled a few years back. 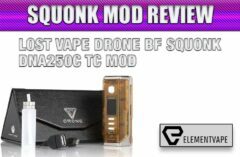 Add in a new chipset under the hood, full temperature control functionality, and an updated version of the solid Guillotine RDA, and there’s certainly enough here to whet a vaper’s appetite. 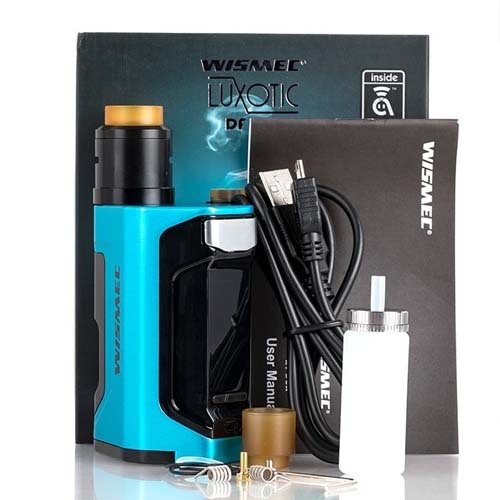 As expected from a Wismec device, the Luxotic DF is extremely well-built and machined. The hexagonal body shape sits well in the palm, and is easy to operate, both when squonking and firing. It’s a little hefty, but that’s to be expected considering how many “moving parts” Wismec stuck under the hood. The squonk bottle, located in the traditional “ring finger” trigger position, is extremely pliable, but also prone to some minor leaking if it’s filled even a drop over the recommended fill limit. I much prefer a thicker, more resistant bottle in my bottom-feed devices, but for effortless squonk mechanics with just a slight press, this bottle should make a lot of people happy. The buttons and operation keys are all extremely well-done. Nothing flashy, nothing formidable, nothing worth calling a relative to boast about. But they’re solid, clicky and responsive – basically, all you need. 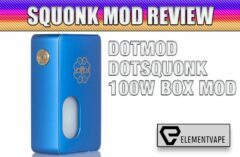 The same attention to quality is evident through the rest of the construction, with a rock-solid 510 connection, smooth and secure battery compartment, and just a general sense of reliability – something you don’t see too often in squonk mods. Depending on your perspective, the Luxotic DF’s display is either a shining highlight, or a significant letdown. 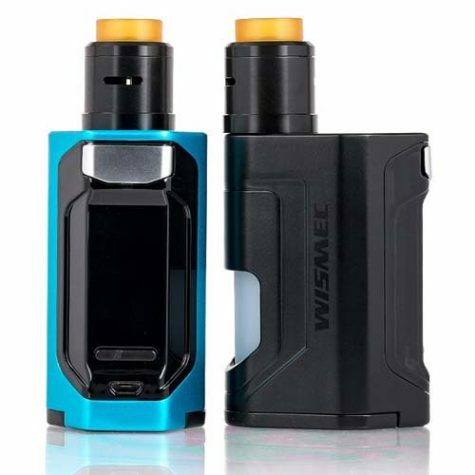 There was a time, a few years back, when I thought Wismec’s hexagon-block layout to be the most-efficient use of a monochrome OLED. I also remember that it was a smart, legible use of screen real estate, moving the standard past the same-y, horizontal layout. Well, a lot of time has passed since I wrote that. A lot of mods have crossed my desk. And a lot of new ideas have been introduced. 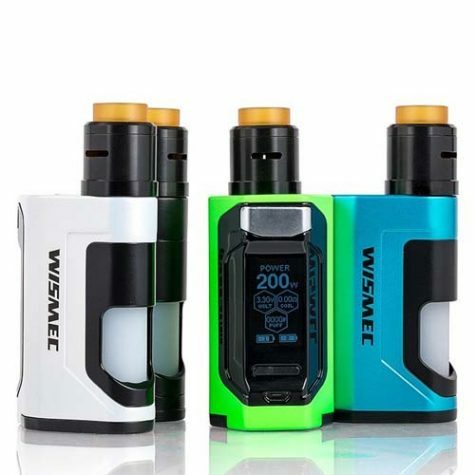 Yet, it seems like Wismec was sitting on a hefty pile of these displays, because not one thing has changed in the years since. Even connected to the supposedly new Avatar chipset, the display and menu system is shockingly old-fashioned. Maybe there’s nothing inherently wrong with a “three-click” operation platform, but wouldn’t it have been worth it for Wismec to at least TRY and implement something new? To be fair, the Luxotic DF showed me some of the finest dual-18650 battery life we’ve ever seen on a high-wattage squonk mod. Not just minutes or a few hours – I saw near all-day performance, even when pushing the Luxotic a lot harder than most users would even consider. So, it’s clear that the Avatar chipset isn’t some piece of vaporware (no pun intended) but we kinda wish it felt a lot more modern than it currently does. By that, I mean, everything on the mod kit works. 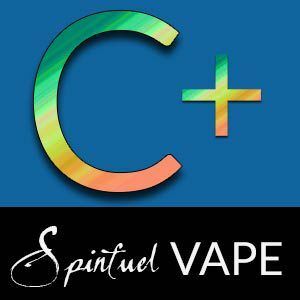 You can add coils, wick, squonk and enjoy it well enough. But is that enough anymore? 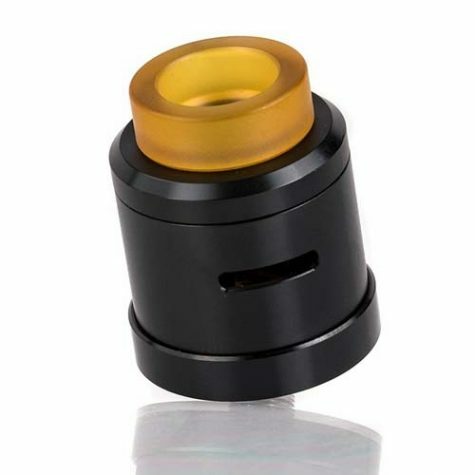 For starters, the Guillotine V2 is a perfectly adequate, clamp-style RDA, that even features the ability to invert the cap to move airflow from the bottom to the top. Nothing innovative, but a nice feature all the same. But the performance is middling. 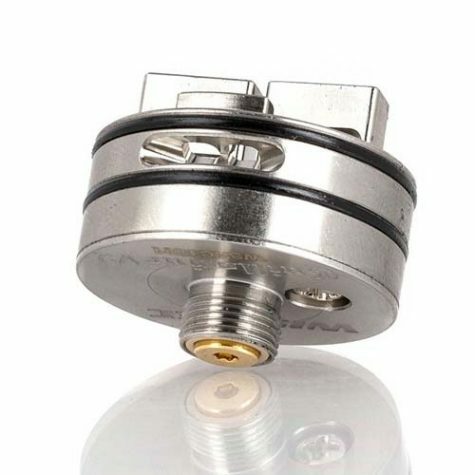 No matter how I set up my Guillotine V2 there were numerous problems with juice flow coming from the Luxotic DF, as if there was a problem with the squonk pin connection. Additionally, building on these clamp-style decks is an exercise in frustration without “guesstimating” your lead length. Sure, I have more than a few of those guide tools lying around, but I also have several wasted coils that I trimmed too snugly, thanks to decks that require expert builders just to place them on the RDA. In terms of build quality, the Guillotine is well done, but pedestrian. It hits enough right marks to keep it as part of the Luxotic DF kit, but I don’t think you should be hunting for one of these on your next shopping trip. Moving back to the mod, the Luxotic mirrors the performance of the Guillotine V2 – erratic, often quirky, and wholly unimpressive. In just my first few hours with the mod, I experienced several misfires due to a sloppy battery connection. I had trouble locking in my temperature settings, had to reseat my coils several times, and even got a “no atomizer” warning without ever touching the RDA. But do you know what I also had? Occasional bursts of flavorful, high-performing squonk mod enjoyment. There were plenty of these times, to be honest… but they were simply interrupted by too many hiccups and poor results. It’s not entirely “bad.” But the Luxotic DF also isn’t memorable… and in a world with some very strong, and evolving bottom-feed mods, the DF simply doesn’t do anything that makes me want to recommend it. 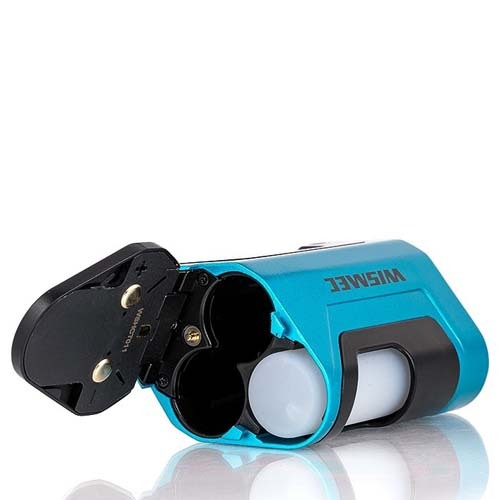 The battery life may be outstanding, the design may be proven, and the dual-18650/200-watt power certainly warrants a discussion. But I was shocked by how old and retro the experience felt in 2019… and I was even more shocked by how many of yesteryear’s errors are still appearing on modern devices.